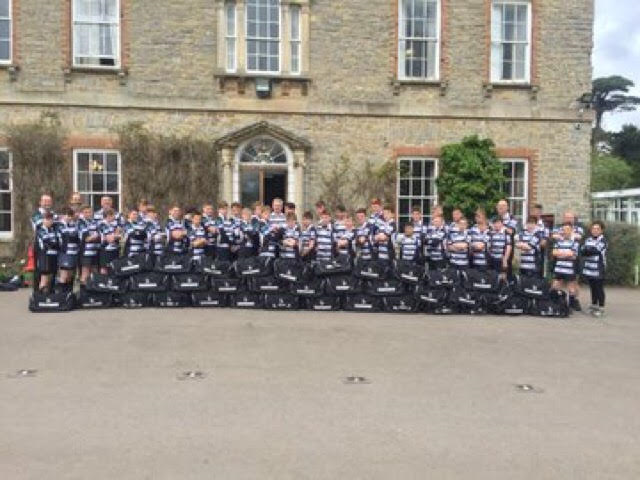 Chinnor U14s continued on their hugely impressive start to 2019 with another rousing and resounding win away at previously unbeaten A&C. On a bitterly cold morning high on the Chilterns plateau, with the wind seemingly blowing off the Russian Steppes, even these inclement conditions could not put the boys off their attractive brand of handling, running rugby. Played over 4 quarters all 32 players contributed superbly to this fantastic display and every one of the boys can be justifiably proud of their performance. A&C seemed to have stacked their teams in the opening 2 quarters and made a fast start. There were two different styles of rugby on show as the home side looked to utilise their big runners close to the ruck and concentrated on kicking for position and hardly moving the ball beyond their fly half. However, this tactic was thwarted by superb defence and low tackle technique around the fringes, where Ben C, Churchy and Ted were especially prominent with numerous big hits and jackals. A&C eventually opened the scoring but not before our boys defence had tired their big ball carriers out, something that was going to pay immense dividends for the boys later in the match as they ran their opponents ragged. When Chinnor did get possession they immediately launched the expansive gameplan, releasing Freddie in space. He showed his trademark pace and skill combined with a newly acquired jackhammer hand-off, which seemed to give him more velocity as he left several defenders trailing in his wake as he crossed from 50 metres to draw level. Freddie added his second score in very similar circumstances in the second quarter when he exploited good quick ball after good carries from Jaco and Jimmy to again power past numerous defenders. The boys had put in an excellent shift and nullified the threat of the opposition really well. A tendency to kick the ball away in the difficult conditions was the only minor blip , giving the ball back to the opposition to attack. If they trust their skills and support then a few phases of recycled possession, even deep in defensive territory, would lead to gaps to exploit. 3-2 at half time. It was good to see Ed B back in the team, after a long series of injuries, and when he’s fully back up to speed he’ll add even more cutting edge to an already impressive array of options. As the match continued it was remarked that we were seemingly witnessing a preliminary round of Crufts on the side line or a dog fashion show with a myriad of canine coats and hats on show. Was is compulsory for all spectators to be accompanied by their four legged friends? The one piece of good news was the ceaseless cacophony of yapping and barking was blocking out the increasingly frantic exultations of the A&C coaching staff. The third quarter had kicked off with a bang as the boys launched a spectacular ten minutes of rugby to score three unanswered tries. They really upped the pace of the game and showed superb ambition and skill to blow the opposition away. Quick ball was immediately exploited by Nathan who scorched in at the corner. Charlie S had an awesome match combining his raw power with skill and pace. He blasted through the centre to score from 30 metres and then showed tremendous pace and desire to track a wonderful 60 metre run by Harvey to appear on his shoulder and take the offload to score under the posts. Nathan then scored his second after good work from Oscar. The boys also showed the defensive side of their game where James H was always to the fore with his chop tackling stopping any attack in its tracks. From a succession of defensive phases A&C eventually spilled the ball 10 metres from Chinnor’s line. It was great to see the boys realign quickly and immediately move the ball away from contact and into space, epitomised by a superb take and give from Guy B. The ball was moved to Charlie who showed immense speed endurance to accelerate away from the defence to score from 90 metres. Nathan was again released by the smoothly functioning double pivot of Wilf and Joseph V, both running straight and distributing with skill and intelligence, to crash over for his now almost regulation hat trick. Tom C picked from the base of a scrum on half way went blind and powered through and then away from the cover defence. Not to be out done Charlie finished off his finest display of the season with his well deserved hat trick try after good work from Ben F and Joe G. These last two tries were converted in the poor conditions by Ben W. Final score 9-4 to the boys. What a performance from the whole squad and although they’ll be going in separate directions with 2 games per Sunday over the next couple of weeks in different locations it is hoped and expected they will keep their focus and commitment to improve on all occasions.